Sweeney Todd: The Demon Barber of Fleet Street is a 2007 British-American period musical fantasy horror film directed by Tim Burton. It is an adaptation of Stephen Sondheim and Hugh Wheeler's Tony Award-winning 1979 musical of the same name and re-tells the Victorian melodramatic tale of Sweeney Todd, an English barber and serial killer who murders his customers with a straight razor and, with the help of his accomplice, Mrs. Lovett, processes their corpses into meat pies. Having been struck by the cinematic qualities of Sondheim's musical while still a student, Burton had entertained the notion of a film version since the early 1980s. However, it was not until 2006 that he had the opportunity to realize this ambition, when DreamWorks announced his appointment as replacement for director Sam Mendes, who had been working on such an adaptation. Sondheim, although not directly involved, was extensively consulted during production. The film stars Johnny Depp as Benjamin Barker / Sweeney Todd and Helena Bonham Carter as Mrs. Lovett. Depp, not known for his singing, took lessons in preparation for his role, which producer Richard D. Zanuck acknowledged was something of a gamble. However, Depp's vocal performance, despite being criticized as lacking certain musical qualities, was generally thought by critics to suit the part (see Music section below). Sweeney Todd: The Demon Barber of Fleet Street was released in the United States on December 21, 2007, and in the United Kingdom on January 25, 2008, to largely enthusiastic reviews. The film won a number of awards, including the Golden Globe Award for Best Motion Picture – Musical or Comedy, the Golden Globe Award for Best Actor – Motion Picture Musical or Comedy and the Academy Award for Best Art Direction. Carter was nominated for a Golden Globe Award for Best Actress – Motion Picture Musical or Comedy, and Depp was also nominated for an Academy Award for Best Actor. Although not an outstanding financial success in the U.S., it performed well worldwide, and has spawned a soundtrack album and various DVD releases. In 1846, Benjamin Barker, a barber, arrives in London, accompanied by sailor Anthony Hope. Fifteen years earlier, he was falsely convicted and sentenced to penal transportation by the corrupt Judge Turpin, who lusted after Barker's wife Lucy. Barker adopts the alias "Sweeney Todd" and returns to his old Fleet Street shop, situated above Mrs. Nellie Lovett's meat pie shop. He learns that Turpin raped Lucy, who then poisoned herself with arsenic. The couple's daughter, Johanna, is now Turpin's ward, and is the object of Turpin's lust. Todd vows revenge, and re-opens his barber shop after Mrs. Lovett returns his straight razors to him. Anthony becomes enamored with Johanna, but is caught by Turpin and driven away by his corrupt associate, Beadle Bamford. Todd denounces faux-Italian barber Adolfo Pirelli's hair tonic as a fraud and humiliates him in a public shaving contest. A few days later, Pirelli arrives at Todd's shop, with his boy assistant Tobias Ragg. Mrs. Lovett keeps Toby occupied while Pirelli identifies himself as Todd's former assistant, Davy Collins, and threatens to reveal Todd's secret unless Todd gives him half his earnings. Todd kills Collins to protect his secret, and hides his body in a trunk. After receiving advice from Bamford, Turpin visits Todd for grooming, intent on marrying Johanna. Todd shaves Turpin, preparing to slit his throat; they are interrupted by Anthony, who reveals his plan to elope with Johanna before noticing Turpin. Turpin leaves enraged and Todd vents his rage by killing customers while waiting for another chance to kill Turpin, and Mrs. Lovett bakes the victims into pies to dispose of their bodies. Todd rigs his barber's chair with a pedal-operated mechanism that deposits his victims through a trapdoor into Mrs. Lovett's basement bakehouse. Anthony searches for Johanna, whom Turpin has sent to an insane asylum upon discovering her plans to elope with Anthony. The barbering and pie-making businesses prosper, and Mrs. Lovett takes Toby as her assistant. She tells an uninterested Todd of her plans to marry him and move to the seaside. Anthony discovers Johanna's whereabouts and, following Todd's suggestion, poses as a wigmaker's apprentice to rescue her. Todd has Toby deliver a letter to Turpin, telling him where Johanna will be brought when Anthony frees her. Toby has become wary of Todd and tells Mrs. Lovett of his suspicions, which grow when he sees her using Collins' coin purse. Bamford arrives at the pie shop, informing Mrs. Lovett that neighbors have been complaining of the stink from her chimney. Todd distracts him with an offer of a free grooming and murders him. Mrs. Lovett informs Todd of Toby's suspicions, and the pair search for Toby, whom Mrs. Lovett has locked in the bakehouse. He has hidden himself in the sewers after seeing Bamford's body drop into the room from the trapdoor above, as well as finding a human toe in a pie and a hand in the meat grinder. Meanwhile, Anthony brings Johanna, disguised as a young sailor, to the shop, and has her wait there while he leaves to find a coach. A beggar woman enters the shop in search of Bamford, and Johanna hides in the trunk. The woman recognizes Todd, but upon hearing Turpin coming, Todd quickly kills her and sends her through the trapdoor. As Turpin enters, Todd explains that Johanna had repented and is coming to him, then offers a free shave in the meantime; as Turpin finally recognizes Todd as Benjamin Barker, Todd stabs him several times before cutting his throat and sending his body to the bakehouse as well. Johanna comes out of her hiding place, still in disguise, and Todd prepares to slit her throat as well, not recognizing her as his daughter. However, hearing Mrs. Lovett scream in horror in the basement as a dying Turpin grabs her dress, Todd lets Johanna go. Todd discovers that the beggar woman was his wife Lucy, whom he believed to be dead, and that Mrs. Lovett misled him about her death. Todd pretends to forgive her and dances with her before hurling her into the bakehouse oven, then cradles his wife's dead body in his arms. Toby climbs from the sewers and Todd allows Toby to slit his throat with his own razor. Toby leaves the basement as Todd bleeds to death over his dead wife. Tim Burton first saw Stephen Sondheim's 1979 stage musical, Sweeney Todd: The Demon Barber of Fleet Street, as a CalArts student in London in 1980. Burton recalled his experience of seeing the show, saying, "I was still a student, I didn't know if I would be making movies or working in a restaurant, I had no idea what I would be doing. I just wandered into the theatre and it just blew me away because I'd never really seen anything that had the mixture of all those elements. I actually went three nights in a row because I loved it so much." Although not a fan of the musical genre, Burton was struck by how cinematic the musical was, and repeatedly attended subsequent performances. He described it as a silent film with music, and was "dazzled both by the music and its sense of the macabre." When his directing career took off in the late 1980s, Burton approached Sondheim with a view to making a cinematic adaptation, but nothing came of it. In Sondheim's words, "[Burton] went off and did other things." Meanwhile, director Sam Mendes had been working on a film version of the story for several years, and in June 2003 Sondheim was approached to write the script. Although he turned down the offer, Mendes and producer Walter F. Parkes obtained his approval to use writer John Logan instead. Logan had previously collaborated with Parkes on Gladiator, and claimed his biggest challenge in adapting the Sondheim stage play "was taking a sprawling, magnificent Broadway musical and making it cinematic, and an emotionally honest film. Onstage, you can have a chorus sing as the people of London, but I think that would be alienating in a movie." Mendes left to direct the 2005 film Jarhead, and Burton leaped at taking over the direction after his project, Ripley's Believe It or Not!, fell apart due to its excessive budget. On Burton's hiring, he and Logan reworked the screenplay; Logan felt they agreed over the film's tone due to "share[d] stunted childhoods watching Amicus movies". Turning a three-hour stage musical into a two-hour film required some changes. Some songs were shortened, while others were completely removed. Burton said "In terms of the show, it was three hours long, but we weren't out to film the Broadway show, we were out to make a movie, so we tried to keep the pace like those old melodramas. Sondheim himself is not a real big fan of movie musicals, so he was really open to honing it down to a more pacey shape." Burton and Logan also reduced the prominence of other secondary elements, such as the romance between Todd's daughter Johanna and Anthony, to allow them to focus on the triangular relationship between Todd, Mrs. Lovett, and Toby. DreamWorks announced Burton's appointment in August 2006, and Johnny Depp was cast as Todd. Christopher Lee, Peter Bowles, Anthony Head, and five other actors were set to play the ghost narrators, but their roles were cut (Head does appear in an uncredited cameo as a gentleman who congratulates Depp after the shaving contest). According to Lee, these deletions were due to time constraints caused by a break in filming during March 2007, while Depp's daughter recovered from an illness. Burton's domestic partner Helena Bonham Carter was cast in October 2006, as well as Sacha Baron Cohen. In December 2006, Alan Rickman was cast. In January 2007, Laura Michelle Kelly was cast as Lucy Barker. Timothy Spall was added to the cast, and said he was urged to audition by his daughter, who wanted him to work with Depp. He recalled, "I really wanted this one – I knew Tim was directing and that Johnny Depp was going to be in it. My daughter, my youngest daughter, really wanted me to do it for that reason – Johnny Depp was in it. (She came on set to meet Depp) and he was really delightful to her, she had a great time. Then, I took her to the junket – and (Depp) greeted her like an old pal when he saw her. I've got plenty of brownie points at the moment." Three members of the cast had never been in a film before: Ed Sanders was cast as Toby, Jayne Wisener as Johanna, and Jamie Campbell Bower, who auditioned, and after four days got the part of Anthony said "I think I weed myself. I was out shopping at the time and I got this call on my mobile. I was just like, 'OH MY GOD!' Honestly, I was like a little girl running around this shop like oh-my-god-oh-my-god-oh-my-god." Filming began on February 5, 2007 at Pinewood Studios, and was completed by May 11, despite a brief interruption when Depp's daughter was taken seriously ill. Burton opted to film in London, where he had felt "very much at home" since his work on Batman in 1989. Production designer Dante Ferretti created a darker, more sinister London by adapting Fleet Street and its surrounding area. Burton initially planned to use minimal sets and film in front of a green screen, but decided against it, stating that physical sets helped actors get into a musical frame of mind: "Just having people singing in front of a green screen seemed more disconnected". Depp created his own image of Todd. Heavy purple and brown make-up was applied around his eyes to suggest fatigue and rage, as if "he's never slept". Burton said of the character Sweeney Todd, "We always saw him as a sad character, not a tragic villain or anything. He's basically a dead person when you meet him; the only thing that's keeping him going is the one single minded thing which is tragic. You don't see anything else around him." Depp said of the character, "He makes Sid Vicious look like the innocent paper boy. He's beyond dark. He's already dead. He's been dead for years." Depp also commented on the streak of white in Todd's hair, saying, "The idea was that he'd had this hideous trauma, from being sent away, locked away. That streak of white hair became the shock of that rage. It represented his rage over what had happened. It's certainly not the first time anyone's used it. But it's effective. It tells a story all by itself. My brother had a white spot growing up, and his son has this kind of shock of white in his hair." Burton insisted that the film be bloody, as he felt stage versions of the play which cut back on the bloodshed robbed it of its power. For him, "Everything is so internal with Sweeney that [the blood] is like his emotional release. It's more about catharsis than it is a literal thing." Producer Richard D. Zanuck said that "[Burton] had a very clear plan that he wanted to lift that up into a surreal, almost Kill Bill kind of stylization. We had done tests and experiments with the neck slashing, with the blood popping out. I remember saying to Tim, 'My God, do we dare do this?'" On set, the fake blood was colored orange to render correctly on the desaturated color film used, and crew members wore bin liners to avoid getting stained while filming. This macabre tone made some studios nervous, and it was not until Warner Bros., DreamWorks and Paramount had signed up for the project that the film's $50 million budget was covered. Burton said "the studio was cool about it and they accepted it because they knew what the show was. Any movie is a risk, but it is nice to be able to do something like that that doesn't fit into the musical or slasher movie categories." After the filming, Burton said of the cast, "All I can say is this is one of the best casts I've ever worked with. These people are not professional singers, so to do a musical like this which I think is one of the most difficult musicals, they all went for it. Every day on the set was a very, very special thing for me. Hearing all these guys sing, I don't know if I can ever have an experience like that again."" Burton said of the singing, "You can't just lip synch, you'd see the throat and the breath, every take they all had to belt it out. It was very enjoyable for me to see, with music on the set everybody just moved differently. I'd seen Johnny (Depp) act in a way I'd never seen before, walking across the room or sitting in the chair, picking up a razor or making a pie, whatever. They all did it in a way that you could sense." Depp said of working with Baron Cohen, when asked what he was like in real life (meaning, not doing one of his trademark characters), "He's not what I expected. I didn't look at those characters and think, 'This will be the sweetest guy in the world'. He's incredibly nice. A real gentleman, kind of elegant. I was impressed with him. He's kind of today's equivalent of Peter Sellers." Burton wanted to avoid the traditional approach of patches of dialogue interrupted by song, "We didn't want it to be what I'd say was a traditional musical with a lot of dialogue and then singing. That's why we cut out a lot of choruses and extras singing and dancing down the street. Each of the characters, because a lot of them are repressed and have their emotions inside, the music was a way to let them express their feelings." He cut the show's famous opening number, "The Ballad of Sweeney Todd", explaining, "Why have a chorus singing about 'attending the tale of Sweeney Todd' when you could just go ahead and attend it?" Sondheim acknowledged that, in adapting a musical to film, the plot has to be kept moving, and was sent MP3 files of his shortened songs by Mike Higham, the film's music producer, for approval. Several other songs were also cut, and Sondheim noted that there were "many changes, additions and deletions... [though]... if you just go along with it, I think you'll have a spectacular time." To create a larger, more cinematic feel, the score was re-orchestrated by the stage musical's original orchestrator, Jonathan Tunick, who increased the orchestra from 27 musicians to 78. The Deluxe Complete Edition soundtrack was released on December 18, 2007. Depp's singing was described by a New York Times reviewer as "harsh and thin, but amazingly forceful". Another critic adds that, though Depp's voice "does not have much heft or power", "his ear is obviously excellent, because his pitch is dead-on accurate... Beyond his good pitch and phrasing, the expressive colorings of his singing are crucial to the portrayal. Beneath this Sweeney’s vacant, sullen exterior is a man consumed with a murderous rage that threatens to burst forth every time he slowly takes a breath and is poised to speak. Yet when he sings, his voice crackles and breaks with sadness." The film's marketing has been criticized for not advertising it as a musical. Michael Halberstam of the Writers' Theatre said, "By de-emphasizing the score to the extent they did in the trailer, it is possible the producers were condescending to us – a tactic which cannot ultimately end in anything but tears." In the UK, a number of audience members walked out of the film on realizing it was a musical, and complaints that advertisements for the film were deliberately misleading were made to both the Advertising Standards Authority and Trading Standards agency. The studios involved opted for a low-key approach to their marketing. Producer Walter Parkes stated, "All these things that could be described as difficulties could also be the movie's greatest strengths." Warner Bros. felt it should take a similar approach to marketing as with The Departed, with little early exposure and discouraging talk of awards. Sweeney Todd: The Demon Barber of Fleet Street officially opened at the United States box office on December 21, 2007 in 1,249 theatres, and took $9,300,805 in its opening weekend. Worldwide releases followed during January and February 2008, with the film performing well in the United Kingdom and Japan. The film grossed $52,898,073 in the United States and Canada, and $99,625,091 in other markets, accumulating a worldwide total of $152,523,164. In the United States, the Marcus Theaters Corporation was not initially planning to screen the film following its premiere, because it was unable to reach a pricing agreement with Paramount. However, the dispute was resolved in time for the official release. Although Sondheim was cautious of a cinematic adaptation of his musical, he was largely impressed by the results. The film received critical acclaim, with Depp's performance receiving critical praise from critics — the review aggregator Rotten Tomatoes reports that 86% of critics gave the film positive reviews, based on 221 reviews, and Metacritic gave the film an average score of 83 out of 100, based on 39 reviews. Sweeney Todd appeared on many critics' top ten lists of the best films of 2007. Of the reviewers, Time rated it an A-minus and added, "Burton and Depp infuse the brilliant cold steel of Stephen Sondheim's score with a burning passion. Helena Bonham Carter and a superb supporting cast bring focused fury to this musical nightmare. It's bloody great." Time's Richard Corliss named the film one of its top ten movies of 2007, placing it fifth. Roger Ebert of the Chicago Sun-Times gave it four stars out of four, lauding Burton's visual style. In his review in Variety, Todd McCarthy called it "both sharp and fleet" and "a satisfying screen version of Stephen Sondheim's landmark 1979 theatrical musical ... things have turned out uniformly right thanks to highly focused direction by Tim Burton, expert screw-tightening by scenarist John Logan, and haunted and musically adept lead performances from Johnny Depp and Helena Bonham Carter. Assembled artistic combo assures the film will reap by far the biggest audience to see a pure Sondheim musical, although just how big depends on the upscale crowd’s tolerance for buckets of blood, and the degree to which the masses stay away due to the whiff of the highbrow." Lisa Schwarzbaum of Entertainment Weekly gave the film a B-plus in its Movie Reviews section and stated, "To stage a proper Sweeney Todd, necks must be slit, human flesh must be squished into pastries, and blood ought to spurt in fountains and rivers of death. Enter Tim Burton, who ... has tenderly art-directed soup-thick, tomato-red, fake-gore blood with the zest of a Hollywood-funded Jackson Pollock." She went on to refer to the piece as "opulent, attentive ... so finely minced a mixture of Sondheim's original melodrama and Burton's signature spicing that it's difficult to think of any other filmmaker so naturally suited for the job." In its DVD Reviews section, EW's Chris Nashawaty gave the film an A-minus, stating, "Depp's soaring voice makes you wonder what other tricks he's been hiding... Watching Depp's barber wield his razors... it's hard not to be reminded of Edward Scissorhands frantically shaping hedges into animal topiaries 18 years ago... and all of the twisted beauty we would've missed out on had [Burton and Depp] never met." In Rolling Stone, Peter Travers awarded it 3½ out of 4 stars and added, "Sweeney Todd is a thriller-diller from start to finish: scary, monstrously funny and melodically thrilling ... [the film] is a bloody wonder, intimate and epic, horrific and heart-rending as it flies on the wings of Sondheim's most thunderously exciting score." As with Time, the critic ranked it fifth on his list of the best movies of 2007. Kirk Honeycutt of The Hollywood Reporter said, "The blood juxtaposed to the music is highly unsettling. It runs contrary to expectations. Burton pushes this gore into his audiences' faces so as to feel the madness and the destructive fury of Sweeney's obsession. 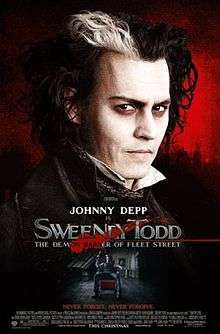 Teaming with Depp, his long-time alter ego, Burton makes Sweeney a smoldering dark pit of fury and hate that consumes itself. With his sturdy acting and surprisingly good voice, Depp is a Sweeney Todd for the ages." Harry Knowles gave the film a highly positive review, calling it Burton's best film since Ed Wood, his favorite Burton film, and said it was possibly superior. He praised all of the cast and the cinematography, but noted it would probably not appeal to non-musical fans due to the dominance of music in the film. Sweeney Todd: The Demon Barber of Fleet Street received four Golden Globe nominations for the January 2008 65th Golden Globe Awards, winning two. The film received the award for Best Motion Picture in the Musical or Comedy genre, and Depp for his performance as Sweeney Todd. Burton was nominated for Best Director, and Helena Bonham Carter was nominated for her performance as Mrs. Lovett. The film was included in the National Board of Review of Motion Pictures's top ten films of 2007, and Burton was presented with their award for Best Director. The film was also nominated for two BAFTA awards, in the categories of Costume Design and Make Up and Hair. Sweeney Todd further received three Oscar nominations at the 80th Academy Awards: Best Actor in a Leading Role for Depp; Best Achievement in Costume Design; and Best Achievement in Art Direction, which it won. Depp won the award for Best Villain at the 2008 MTV Movie Awards. He thanked his fans for "sticking with me on this very obtuse and strange road." He also won the Choice Movie Villain award at the Teen Choice Awards; and at Spike TV's 2008 Scream Awards (filmed on October 18, 2008, and aired three days later), the film won two awards: Best Horror Movie, and Best Actor in a Horror Movie or TV Show (Depp). It was listed as number 490 on Empire's 500 Greatest films of all time. Sweeney Todd: The Demon Barber of Fleet Street was released on DVD in North America on April 1, 2008, and the UK on May 19. A Blu-ray was released on October 21, 2008. An HD DVD release was announced for the same date, but due to the discontinuation of the format, Paramount canceled this version in preference for international distribution of the Blu-ray release. The DVD was released on April 1, 2008 and has thus far sold approximately 1,892,489 copies, bringing in more than $38 million in revenue. Sweeney Todd officially premiered on television on BBC America in October 2010. An edited version of the film appeared as part of "Shocktober", a Halloween themed month event for This TV network in October 2013. The film premiered on British television on Channel 4 on 27 November 2010. ↑ "Sweeney Todd: The Demon Barber of Fleet Street (18)". British Board of Film Classification. December 18, 2007. Retrieved August 28, 2013. 1 2 3 4 "Box office release data". Box Office Mojo, LLC. 2008-03-20. Retrieved 2008-06-30. 1 2 3 4 5 6 7 Brownfield, Paul (2007-11-25). "Tim Burton's slasher film". Los Angeles Times. Retrieved 2007-12-14. 1 2 3 Prince, Chris (2008). "Director's Cut". Ultimate DVD. Visual Imagination (89): 18. ISSN 1468-6112. 1 2 3 4 Daly, Steve (2007-10-31). "'Sweeney Todd': A Musical on the Cutting Edge". Entertainment Weekly. Retrieved 2007-11-06. 1 2 3 4 5 Gold, Sylviane (2007-11-04). "Demon Barber, Meat Pies and All, Sings on Screen". New York Times. Retrieved 2007-11-07. ↑ Susman, Gary (2003-06-26). "Tuning Up". Entertainment Weekly. Retrieved 2007-12-13. 1 2 3 Buckley, Michael (2007-12-16). "Stage to Screens: Logan, Zanuck and Parkes of "Sweeney Todd," Plus "Atonement" Writer Hampton". Playbill. Retrieved 2007-12-16. ↑ Stax (2006-06-13). "Believe It Not: Sweeney before Ripley". IGN. Retrieved 2007-12-15. 1 2 Levy, Emanuel (2008). "Sweeney Todd: The Making of a Musical Movie". Emanuel Levy. Retrieved 2008-01-17. ↑ Martinfield, Seán (2007-12-24). "Depp cleaves a wedge into Broadway Musical". San Francisco Sentinel. Retrieved 2008-01-17. ↑ "Sweeney Todd to Start Filming Early 2007". ComingSoon.net. 2006-08-17. Retrieved 2007-11-06. ↑ "A ghost is exorcised". London: The Daily Telegraph. 2007-05-13. Archived from the original on October 5, 2007. Retrieved 2007-11-06. ↑ Zap2It.com (2006-10-18). "Carter Lands Killer 'Sweeney Todd' Role". Zap2it. Retrieved 2013-10-23. ↑ "Borat And Bonham Carter Sign Up For Sweeney Todd". Hecklerspray.com. 2006-10-19. Retrieved 2013-10-23. ↑ "Rickman Joins Sweeney Todd Cast". Contactmusic.com. Retrieved 2013-10-23. ↑ "Laura Michelle Kelly Joins Cast of Burton's Sweeney Todd". bloody-disgusting.com. January 23, 2007. Retrieved 2013-11-11. Laura Michelle Kelly has joined the cast of Tim Burton’s Sweeney Todd to play Lucy Barker, according to various sources. ↑ "Spall Took Sweeney Todd Role To Please Depp-loving Daughter". ContactMusic.com. January 22, 2008. Retrieved 2013-10-23. ↑ Vilkomerson, Sara (2007). "He's 19, He's Beautiful And He's Bloody Good | The New York Observer". Observer.com. Retrieved 2013-10-23. ↑ Palmer, Martyn (2007-05-20). "Johnny's Treasure Chest". The Mail on Sunday. Johnny Depp Zone Interview Archive. Retrieved 2008-07-04. 1 2 Daly, Steve (2007-10-31). "Johnny Depp: Cutting Loose in Sweeney Todd". Entertainment Weekly. Retrieved 2007-11-06. 1 2 3 Prince, Chris (2008). "Director's Cut". Ultimate DVD. Visual Imagination (89): 20. ISSN 1468-6112. ↑ Daly, Steve (November 3, 2007). "Johnny Depp: Cutting Loose in Sweeney Todd". Entertainment Weekly. ↑ Newgen, Heather (2007-12-19). "Burton, Depp on the Making of Sweeney Todd". ShockTillYouDrop.com. Retrieved 2007-12-17. ↑ Scott, A. O. (December 21, 2007). "Murder Most Musical". The New York Times. Retrieved 2015-05-12. ↑ Thomasini, Anthony (2008-01-12). "An Actor Whose Approach to Singing Lets the Words Take Center Stage". The New York Times. Retrieved 2008-08-13. ↑ Lazare, Lewis (2007-12-10). "Is 'Sweeney Todd' marketing giving moviegoers a haircut?". Chicago Sun-Times. Retrieved 2007-12-10. ↑ Rose, Steve (2008-02-05). "What the Sweeney Todd trailer failed to tell us about the film". London: guardian.co.uk. Retrieved 2008-07-04. ↑ "Cinema Fans Accuse Sweeney Todd Of False Advertising". femalefirst.co.uk. 2008-02-05. Retrieved 2008-07-04. ↑ "Marcus Theatres and Paramount Pictures unable to reach agreement to show Sweeney Todd". The Business Journal, Milwaukee. 2008-01-14. Retrieved 2007-12-22. ↑ "Marcus Theatres not running 'Cloverfield'". The Business Journal. 2008-01-14. Retrieved 2008-07-04. ↑ "Sweeney Todd: The Demon Barber of Fleet Street". Rotten Tomatoes. Retrieved 2010-11-12. ↑ "Sweeney Todd: The Demon Barber of Fleet Street (2007): Reviews". Metacritic. Retrieved 2010-03-14. ↑ "Metacritic: 2007 Film Critic Top Ten Lists". Metacritic. Archived from the original on January 2, 2008. Retrieved 2008-01-05. ↑ Corliss, Richard (2007-12-24). "The 10 Best Movies". Time magazine. p. 40. ↑ Ebert, Roger (2007-12-21). "Sweeney Todd The Demon Barber of Fleet Street". rogerebert.suntimes.com. Retrieved 2008-07-04. ↑ McCarthy, Todd (2007-12-03). "Sweeney Todd The Demon Barber of Fleet Street". Variety. variety.com. Retrieved 2008-07-04. ↑ Schwarzbaum, Lisa (2007-12-21). "Sweeney Todd The Demon Barber of Fleet Street (2007)". Entertainment Weekly. ew.com. Retrieved 2008-07-04. ↑ Nashawaty, Chris (2008-04-04). "Johnny Depp and Tim Burton: A DVD Report Card". ew.com. Entertainment Weekly. Retrieved 2008-07-08. ↑ Travers, Peter (2007-12-13). "Sweeney Todd". Rolling Stone. rollingstone.com. Retrieved 2008-07-04. ↑ Travers, Peter (2007-12-19). "Peter Travers' Best and Worst Movies of 2007". Rolling Stone. rollingstone.com. Retrieved 2007-12-20. ↑ Honeycutt, Kirk (2007-12-04). "Sweeney Todd: The Demon Barber of Fleet Street". The Hollywood Reporter. hollywoodreporter.com. Archived from the original on January 15, 2009. Retrieved 2008-07-04. ↑ Knowles, Harry (2007-11-02). "Harry loves the delicious meat pies of Sweeney Todd: The Demon Barber of Fleet Street". Ain't It Cool News. Retrieved 2007-11-07. ↑ "65th Golden Globe Awards Nominations & Winners". goldenglobes.org. Archived from the original on 2008-12-17. Retrieved 2008-01-13. ↑ "Hollywood Foreigh Press Association 2008 Golden Globe Awards for Year Ended December 31, 2007". goldenglobes.org. 2007-12-13. Archived from the original on December 14, 2007. Retrieved 2007-12-13. ↑ "The Golden Globe Nominations!". ComingSoon.net. 2007-12-13. Retrieved 2007-12-13. ↑ "Awards for 2007". National Board of Review of Motion Pictures. Retrieved 2007-12-10. ↑ "Film Awards Nominees in 2008 – Film – Awards – The Bafta site". bafta.co.uk. 2008-01-17. Retrieved 2008-01-17. ↑ "80th Academy Awards nominations". Academy of Motion Picture Arts and Sciences. Archived from the original on January 23, 2008. Retrieved 2008-01-22. ↑ "MTV Movie Awards Winners". mtv.com. Retrieved 2008-07-07. ↑ "Teen Choice Awards Winners". Associated Press. 2008-08-03. Archived from the original on August 6, 2008. Retrieved 2008-08-05. ↑ "Legendary Filmmaker George Lucas Makes Surprise Appearance at Spike TV's 'Scream 2008'". Yahoo.com. Retrieved on 2008-10-19. ↑ "500 Greatest films of all time". Empire. Retrieved 17 July 2016. ↑ "Release Dates For Blu-Ray Discs". High-Def Digest. Retrieved 2008-07-04. ↑ "Paramount Cancels Majority of HD DVD Slate (Updated)". High-Def Digest. Retrieved 2008-03-22. ↑ "The-numbers.com". The-numbers.com. Retrieved 2013-10-23.